You should not think that search.GoPhoto.it is the search engine you need to operate if you have chosen to install software from gophoto.it. Even though the application is advertised as a reliable tool which can help you view and share photos via a plugin on your Google Chrome, Mozilla Firefox and Internet Explorer browsers, you may be unpleasantly surprised after installing it onto the PC. As our researchers have discovered, the program may install a browser toolbar and change your regular search tools if you are not careful with the installation process. Even though we do not list the search tool as malicious, it certainly does not provide the most useful search results. Therefore, we advise getting search.GoPhoto.it removed. Third party advertisements are not always malicious; however, they are always suspicious. Third parties may follow privacy policies which could threaten your own virtual security, which is exactly why it is not recommended clicking on any pop-ups, banner offers, in-text links, online surveys, etc. Unfortunately, cyber criminals continuously use online advertising as a backdoor to access your personal computer, drop malicious programs and perform other risky activity. 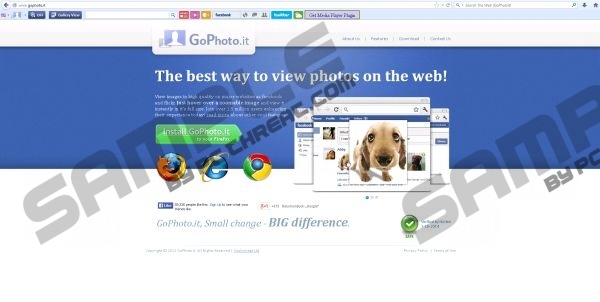 If you do not want to become part of it, you can either choose to tiptoe around the displayed adverts, or install authentic security software to guard your virtual security, or delete search.GoPhoto.it related adware. To remove search.GoPhoto.it related software from the PC successfully, we recommend that you decide how you wish to handle your own virtual security in the future. If you wish to keep it guarded against virtual threats reliably – install automatic malware detection and removal software which will help you delete undesirable programs. If you wish to handle the security yourself, you have to delete all unwanted programs and files manually. Either way, we suggest following the manual removal guides below first. Move to the left of the Task Bar below and open the Start menu. Find the program you want to remove, right-click it and select Uninstall. Double-click Add or Remove Programs to find the undesirable application. Click it and select Remove. Simultaneously tap Alt+F, select Settings and move to On Startup. Now repeat step 3 to delete the undesirable options. Remove (click X) the undesirable search engine and click Done. Open the browser and navigate to the search box on the top-right corner. Remove the undesirable option and click OK.
Now simultaneously tap Alt+T to open the Tools menu. Disable the undesirable search engine after choosing a new default one. Click Close and tap Alt+T one more time. Overwrite/delete the displayed Home Page and click OK.
Quick & tested solution for search.GoPhoto.it removal.